Shield your canine companion's nose and other unprotected areas, even in the harsh sunshine. 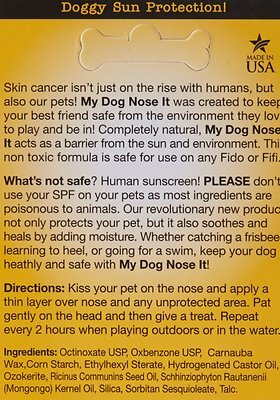 With natural ingredients, My Dog Nose It! is a wax-based balm that acts as a barrier from the sun and other environmental conditions. 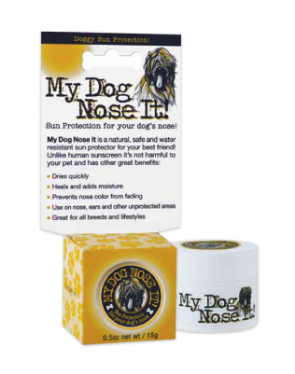 It is especially helpful for dogs with light-colored noses or ear tips with less hair for protection. This lightly scented, soothing balm adds moisture, dries quickly, and can help prevent nose color from fading. Unlike human sunscreen, it is made specifically for canine use. It may be used on all breeds. Ideal for all outdoor activities, including swimming, catching a disc, or agility. Great size to place in pocket or purse. Paraben-free. Made in the USA! Active Ingredients: Octinoxate USP 7.5%, Oxbenzone USP 3%. Inactive Ingredients: Carnauba Wax, Corn Starch, Ethylhexyl Sterate, Hydrogenated Castor Oil, Ozokerite, Ricinis communins Seed Oil, Schinziophyton rautanenii (Mongongo) Kernel Oil, Silica, Sorbitan Sesquioleate, Talc.